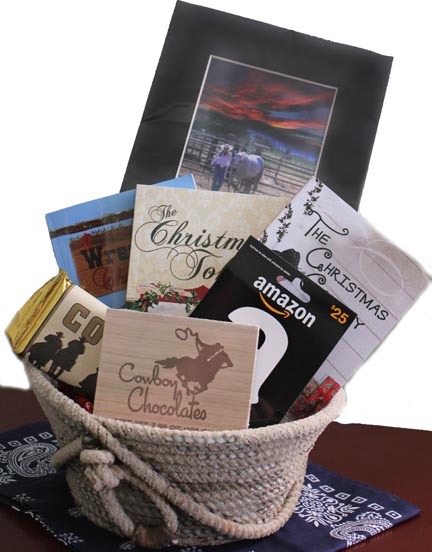 Welcome to this Round Robin blog hop. Our topic this month is a character that wouldn’t leave our minds long after we’ve read a book. Jo March from Little Women is a memorable character for me. I loved the book and all the characters. Each was an example of strength and resilience in the face of hardship and adversity. But Jo stands out to me, first of course because she was a writer. 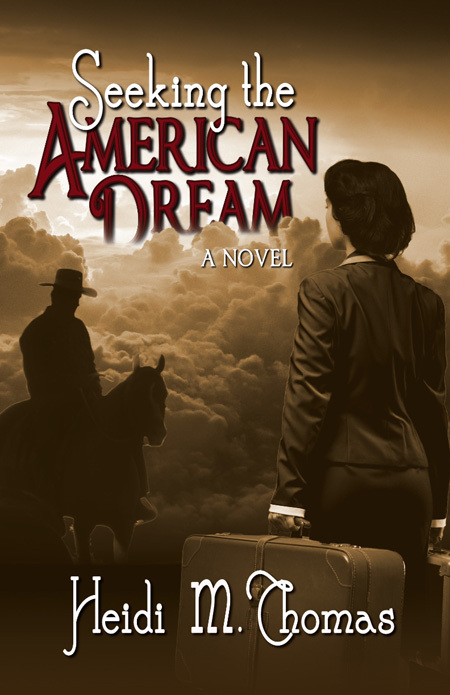 Despite disapproval of her chosen avocation, she perseveres, and eventually writes and publishes a book about her family. I identify with her also because she was quite independent—nobody tells her what she “must” do, and because she was a “tomboy.” I was raised on a ranch and followed my dad around, helped him ride and do various ranch and farm chores. In our isolated community I didn’t have other girls my age to pal around with and I was six years older than my brother. So I made up my own stories, imaginary playmates, and fun. It’s been many years since I’ve read Little Women, Little men and Jo’s Boys, but maybe it’s time to go back an revisit my memorable character! This month’s Round Robin blog topic is a favorite food or meal—appropriate for Thanksgiving! 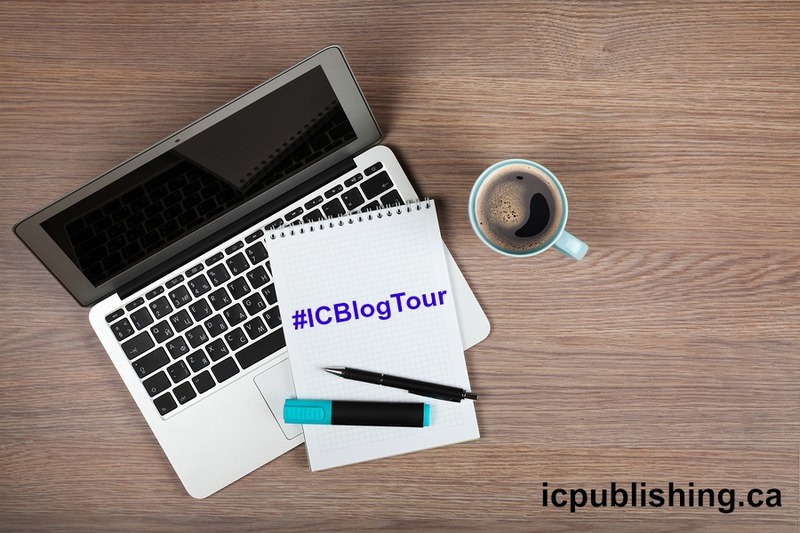 When you’ve finished reading, please visit the other participants to see their favorites. My favorite food is hands-down…can you guess?…wait for it!…OK, I’ll tell you. It’s CHOCOLATE! No surprise to those of you who know me, of course. I think chocolate covers all the food groups and possibly should be a food group all by itself! Eating chocolate is a bit more challenging when you are trying to avoid sugar, like I do (mostly). 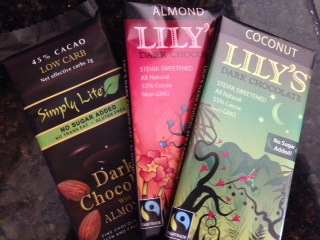 I have recently discovered Lilly’s Chocolate, sweetened with Stevia, in several flavors at my local health food store. Also Trader Joe’s Simply Lite bars are scrumptious (sweetened with sugar alcohols). Here’s a recipe, shared by actress Tracy Pollan that I would like to experiment with, substituting Stevia, unsweetened carob chips and coconut, and canned coconut cream sweetened with Stevia for the sweetened condensed milk. Preheat oven to 350°F. Line bottom of a 9-inch square baking pan with parchment paper. In a large mixing bowl, combine butter, graham cracker crumbs and salt. Stir to mix well. Press crumbs into the bottom of baking pan. Layer on chopped nuts, then semisweet chocolate chips, white chocolate chips and bittersweet chocolate chips. Sprinkle coconut evenly on top. Drizzle on condensed milk, covering everything with a thin layer. Bake about 25 minutes, until golden brown. Let cool completely in pan, then cut into 1 1⁄2-inch bars. Store in an airtight container. Makes 3 dozen Bars. 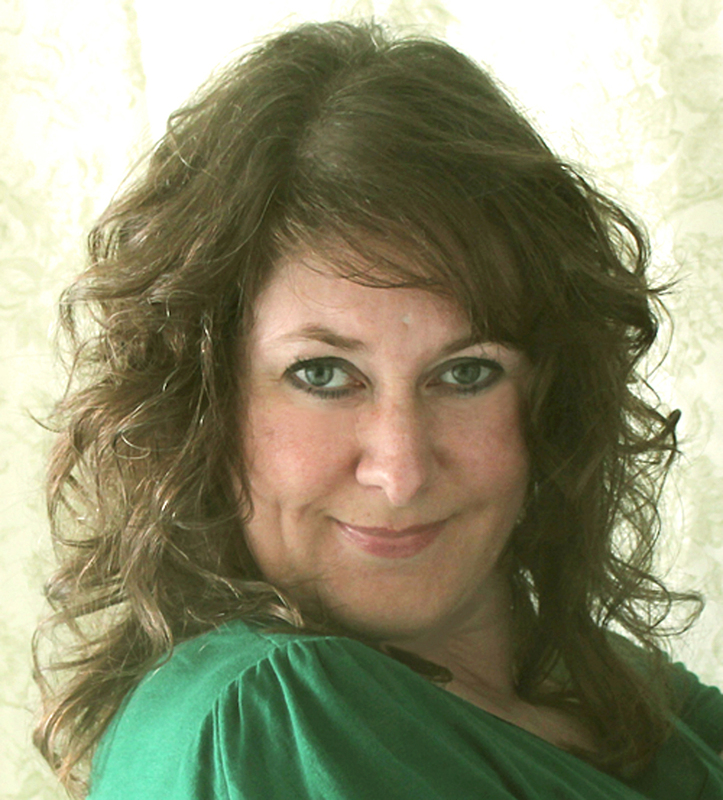 —Excerpted from The Pollan Family Table by Corky, Lori, Dana and Tracy Pollan. Copyright © 2014 by Old Harvest Way, LLC. Excerpted with permission by Scribner, a Division of Simon & Schuster, Inc. 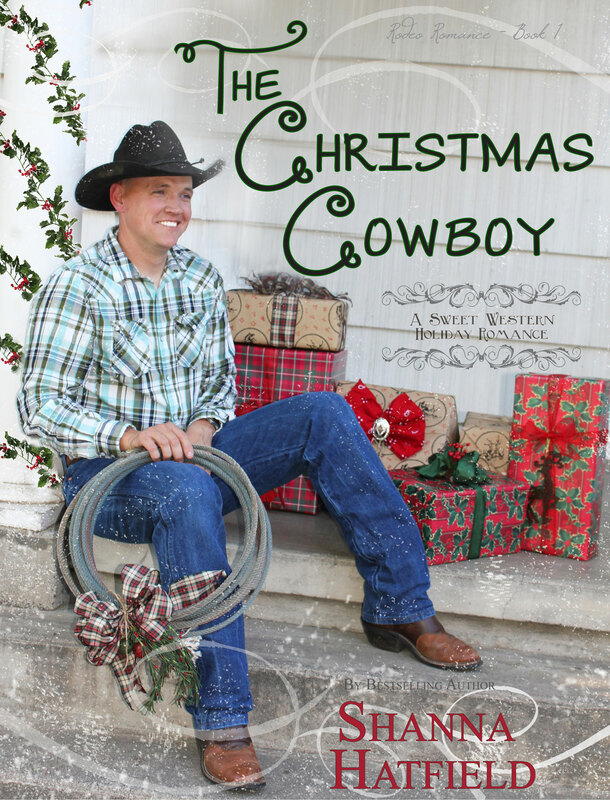 Welcome to Shanna Hatfield’s Cowboys & Christmas Blog Tour! 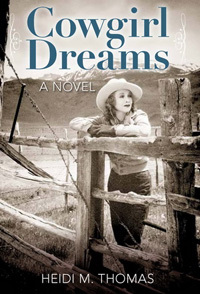 What is it about a cowboy that inspires giddy thoughts of romance in otherwise sane and sensible women? It could be the way they make a pair of jeans look just right. If you haven’t ogled a pair of fine-fitting Wranglers at a rodeo, please take yourself to the nearest medical facility to make sure you’ve got a pulse. It could be the dusty boots on their feet. The dirtier, the better. We want a hard-working, real man, after all. Not one who just dresses like a cowboy on the weekends. It could be that Stetson on his head. There’s something about a man sweeping off his hat in a gesture of polite recognition that makes our knees wobbly and our thoughts scattered. Also, there is something entirely endearing about a man with a hat-ring in his hair. It could be the little swagger in his walk. Most of the cowboys I know don’t work to put it there. 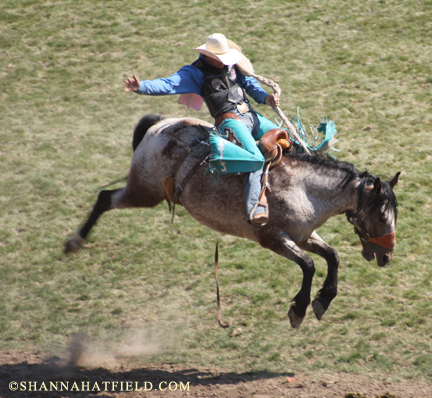 It’s a byproduct of injuries, too many hours in the saddle, and walking in those dusty boots. It could be the manners they exhibit, no matter how rough and tough they might be. You show me a raised-in-the-country cowboy and I’ll show you a man who respects women and elders, says “yes, ma’am,” and holds doors open. I don’t care how independent and strong of a woman you are, when a good-looking cowboy tips his hat and holds a door open for you, it makes you want to swoon. 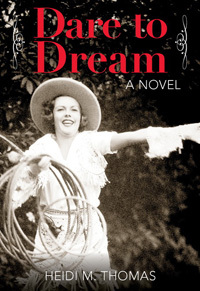 For me, it’s such fun to write about cowboys and the women determined to resist their considerable charms. 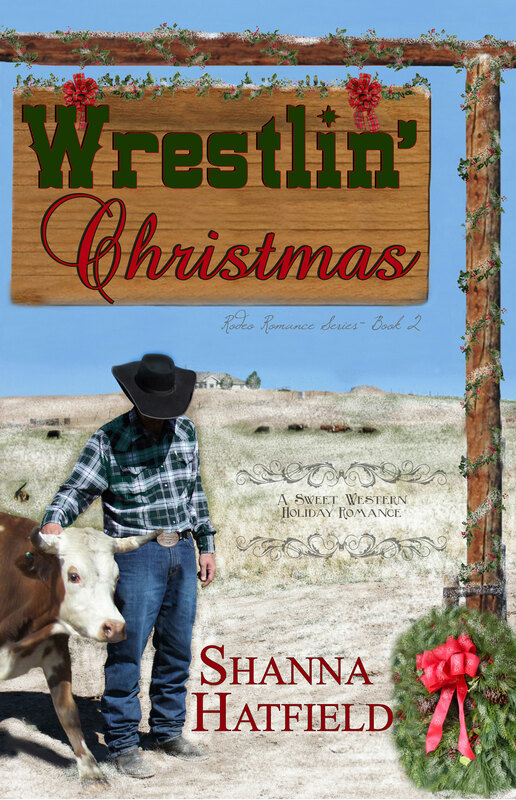 In The Christmas Cowboy and Wrestlin’ Christmas, the first two books in the Rodeo Romance series, neither heroine wanted to fall for a cowboy. In fact, they fought quite a valiant battle – but as they say, sometimes resistance is futile. My novels are historical, so I usually do quite a bit of research before I start writing. They’re also based on a real person, my grandmother, so that helps formulate the storyline. I don’t do a formal outline, but I may jot down notes or an informal timeline. When I have my idea of how to start, I’m in that state of excitement about a new project, and I can’t wait to get going! I often continue research as I’m writing, as questions will crop up and I need specific historical details to ground my characters or the incidents in the story. I belong to a critique group, so that helps keep me on a deadline. I know that every week I have to bring several pages, and the feedback also keeps me on track or gives me ideas where to go from here. Once I’ve finished my first draft and have gone through it with my group, I go back over it and do an initial rewrite or two. Then I have a couple of Beta readers read and critique it and then I do another rewrite before submitting it to my publisher. One thing I learned in a writing class is to give yourself permission to write out of chronological order. If you get to a certain point and are stuck, but you know where you want to be in future pages, go ahead and write that future scene. 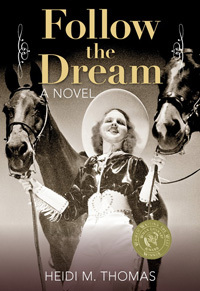 That helps bridge the gap, and gives you an idea of what you need to do to get from Point A to Point B.
I’m the author of a “Dreams” novel trilogy: Cowgirl Dreams, Follow the Dream, and Dare to Dream, and a non-fiction book which has just been released, Cowgirl Up! 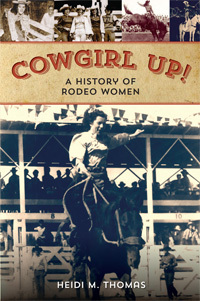 A History of Rodeo Women. You can order autographed copies through my website.